Muay Thai, translated as “Ancestral Boxing”, is the predecessor of Muay Thai. His age makes it very difficult to trace through history. The origin of Muay Thai is confused with the origin of the Thai people. Archaeological evidence suggests that a martial art similar to Muay Boran has been practiced in Southeast Asian countries for about 2,000 years. The creation and training in this art was probably developed for ancient military purposes. Fights that used this style became very popular; such struggles became known as Dhoi Muay, a term now used for boxing and pugilism in general. Muay Boran was divided into Muay ThaSao (North), Muay Korat (East and Northeast), Muay Lopburi (Center Region), and Muay Chaiya (South). There is a phrase in Thai that says “Korat Perforator, Lopburi Wit, Chaiya Posture plus Thasao Rapido”. The focus of Muay Korat is strength. It was called that because it could defeat a buffalo in one fell swoop. There are several versions on the origin of Muay Thai which are good for health. The most accepted by most Muay Thai masters. Muay Thai is currently practiced as a sport in many countries of the world. Its global diffusion has made it one of the most widespread contact sports and its number of practitioners does not stop growing. 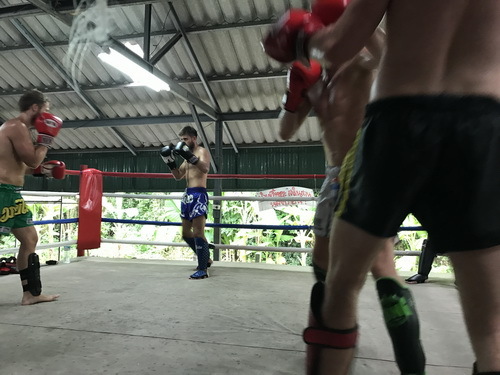 The best Khai Muay (exercise camps) are in Thailand, but currently other countries can compete on equal terms, especially in the higher weight categories. The Netherlands is the birthplace of many famous fighters such as Ernesto Hoost, Peter Aerts or the legendary Ramon Dekkers (8 times world champion) and many more .A legend in Thailand is the champion Buakaw by Pramuk a fighter very characteristic for his speed and legs, he says that his kick is worse than the “kick of a horse”. A good defense is the Muay Thai base. Scrolling to dodge hits would be the best when it is not possible you should block. Nor is there time to prevent the blows? Below are some tips on how you can improve your defense. The first advice to enhance your defense would be merely to make the shadow. When you start with Muay Thai sport, it is imperative to do it little by little, so it is best to be there making shade in front of mirrors or with your companions and start a lot with the displacement. Making the steps back, forward, lateral, diagonal, to begin to avoid in your mind the blows that come. You can practice the Lob. You can practice the elusive and the blocks by taking care of your health. It is all essential to being practicing first in shadow quietly during training, without your partner, without your opponent, that he is already trying to hit you. For the second advice, is to train a lot your agility, the more agile you are, because it is easier to avoid the blows, be sure they do not reach you. It is easy to block them and be hard, but I think that at the beginning it is better to avoid being hit. So your opponent gets tired more. It is also essential to train your resistance a lot so that you can do the same when you start with the first round and when you are in the fifth round. Very important that you have an excellent resistance, for when the blow comes, you block it, you can hold it well in the first round and then when you start in the last round and it hits you with the same force, that you can block it just as well. That you do not slip and fall, because of course, the balance is very important and punctuates it well.